A few of the contributors are friends. I have done my best to give an unbiased review. I often have trouble with short story collections. I’ll read a story, then put the book down and wander off for a while. It takes me forever to get through an entire anthology, no matter how good the stories are. I was surprised to find that wasn’t the case with Defying Doomsday. Robert Hoge’s introduction hooked me right from the start by providing an insightful context for the anthology and setting the tone. 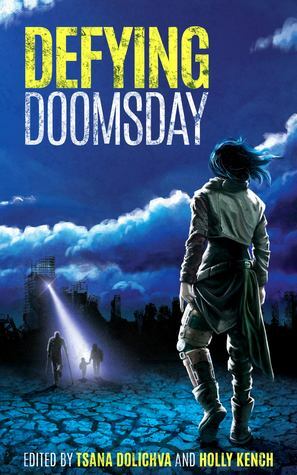 Corinne Duyvis then took over with an earth-shaking story that managed to be both angry and hopeful, confronting the casually discriminating attitudes that occur in most apocalyptic fiction and everyday life by examining the difference between equality and equity. It made for an epic start to the anthology. Not all of the apocalypses featured in this anthology arrived with a bang. While some of them came out of nowhere (Did We Break the End of the World? by Tansy Rayner Roberts and I Will Remember You by Janet Edwards), others were a long time coming and seep in around the edges (Something in the Rain by Seanan McGuire). Some were brought on by aliens (In the Sky with Diamonds by Elinor Caiman Sands) and some humanity inflicted on itself (Five Thousand Squares by Maree Kimberley). The diversity of disabilities mirrored the diversity of apocalypses. There were characters who were blind or deaf. Some were missing limbs or had Crohn’s disease or were on the autism spectrum. Whatever the case, the characters were always more than their disability and were shown as fully realised people. In some stories, these disabilities posed additional obstacles to survival–such as ongoing treatment for cystic fibrosis or navigating an unfamiliar environment while blind. However, my favourite stories were the ones where the character’s disability was the reason for their survival, such as Emm’s missing legs allowing her to confuse the spiders in Samantha Rich’s Spider Silk, Strong as Steel. I’d like to give a special mention to John Chu’s Selected Afterimages of the Fading. Written in second person, it tells the story of a genius who suffers from body dysmorphia, continually perceiving himself to be smaller and weaker than he actually is. This results in a compulsion to workout near constantly. I appreciated the way the character was both a genius scientist and a body-builder. I think the choice of second person illustrated his misperception well. And I adored that the story also manages to be a rather sweet gay romance. There are a few stories that I felt were a little weaker than the rest, but overall it was a strong anthology and I enjoyed it even more than I enjoyed Kaleidoscope. Oh that sounds like a wonderful sf anthology! I think mostly these are always uneven but I do love exploring the different stories. It takes me ages to get through them, too, I only read a story at a time. It’s fantastic that this one shows how disability and differently-abled people’s experiences are not homogeneous. I’ll need to watch out for a copy! Anthologies always have a few stories I dislike, but the ratio seemed lower in this one. It’s by a small Australian press, so it’s probably worth ordering online rather than searching in book shops.